Thursday several of us traveled to Sumter to see Pat Nagle. Pat is Eleanor Burns' sister. She travels the east coast every year giving a trunk show of Eleanor's newest books and patterns. Of course she is selling, also. It was great fun. Her newest book is due out any day. 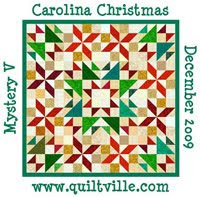 It is Barns Quilts. 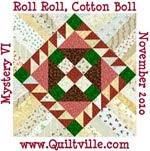 The idea is from all the barns with quilt blocks on them that are popping up all over the place. The black and white is from Orion's Star. The leave is Autumn Leaves Pattern. 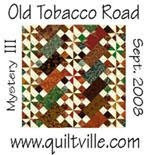 And here is one of the Barn Quilt quilts. This one is Pat's version. Looks like Eleanor's new book will have to come to my house. I love the Barn Quilt. Thanks for sharing. Me too, we got to pre order the book and I did. LOL.